Rhiannon Osborne-Tonner is at UCL studying Natural Sciences focusing on genetics, mathematics and statistics. 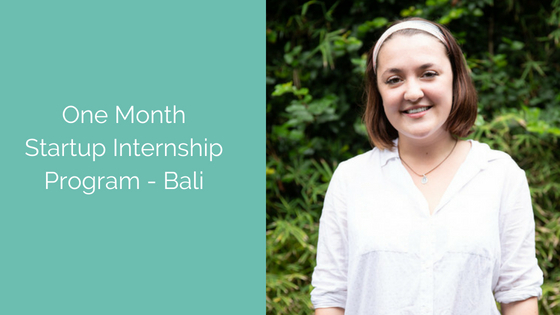 She spent one month on Start Me Up’s Startup Internship Program in Bali. I refused to believe that I had to make that choice. And so, I found Start Me Up which lets you do an internship while traveling so it’s the perfect combination, really. During my time in Bali I’ve been working on a project developing an app that helps collaboration in co-working spaces. For the first part of the project, I was responsible for the design and UX of the app. So going from the idea to exactly what we want the app to look like. And more recently, I’ve been developing a static landing page for people to download the app from. It’s been quite challenging. It was definitely out of my comfort zone. Designing is something I’ve never done before so that posed a few challenges for me. But I also love that I don’t have to work 9-5. You can do the hours you want, you can do a yoga class in the middle of the day or go for a walk along the beach. I’ve been to quite a few workshops which have been varied. One of the reasons why I’m here is to try and figure out what I want to do next so being able to attend a variety has been helpful. This internship has definitely changed the way I looked at work. As I’ve said before, I’ve always been painted a picture that you can’t have it all; that you can’t travel and have a really successful career. Being out here and talking to people and actually seeing it first hand, I can see that now you can have this lifestyle. It’s not without its negatives and its challenges but it is possible to do it. To prospective applicants/interns, I’d say come with an open mind. On my first day, I had no idea what was expected of me and when my project was put on my lap, I freaked out. But it turned out to be an eye-opening experience and I learned a lot.